A Short Hop is a great choice for family accommodations close to the beach! Enjoy the Ocean Drive Difference by starting your vacation immediately upon arrival, as this property comes with fresh bed linens/bath towels, the beds are already made up for you, and the departure maid service are all included in your price. This home is in the Ocean Drive section featuring 5 bedrooms, two and a half baths, fully equipped kitchen with extra oven, an extra refrigerator, large deck with patio furniture, and wireless internet. New floors were installed in the kitchen, dining and living room areas in 2016, and a deck roof has been added recently to provide shade as you relax in your chaise lounge with a cold drink. There is also new deck furniture for the 2018 season. You can even see a peek of the ocean as you relax in it! Your group will love the big, open yard with plenty of space for games and even a swing set for smaller children. Two private outdoor showers make it easy to wash off sand and salt from the beach before going inside. 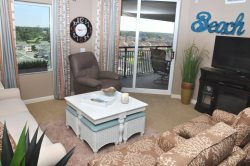 The living room offers lots of comfortable seating and a big flat screen TV for your entertainment. There are also flat screen TVs in all bedrooms. Your days on the beach are worry-free; there is a beach access just 50 yards from the front door of this house on 9th Avenue North. Small dogs are welcome too! Main St is only 9 blocks away, where you can browse beach stores and boutique shops, dance in the nightclubs, and enjoy unique restaurants. Summertime brings weekly live music and an oceanfront amusement park at the OD Pavilion. Rent this home for your summer vacation and get unlimited access to pools, hot tubs, lazy river and other great amenities at the Ocean Drive Resort, just 8 blocks away! Take advantage of these amenities to add value and fun to your vacation. You will also get access to our own Endless Fun Club, a special discount program that gives you deals and extras at local businesses, only for our guests. Call us today to book your vacation at A Short Hop!